With developments in medicine and a growing understanding of how to lead a healthy lifestyle, our population is living longer. But with this longevity comes the need to look after your body, to ensure you can enjoy your later years by staying active, pain-free and cognitively alert. 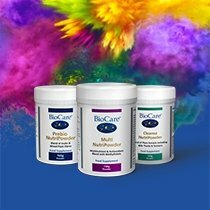 At BioCare, we produce a number of supplements for the over 50s that prioritise nutrients that are popular with this demographic such as fish oils, antioxidants, glucosamine and CoQ10. You can browse our products below, or read on for more information. Another supplement with fish oils is our unique supplement BioMulsion® JointGuard®. As well as providing an intense dose of EPA and DHA from fish oil derived from anchovies, BioMulsion® JointGuard® includes glucosamine hydrochloride, vitamin E and ginger. We use our own special ‘Multox’ system to enhance the stability of the antioxidants, and our NEO-3 process that uses lipase enzymes to ensure optimum absorption. 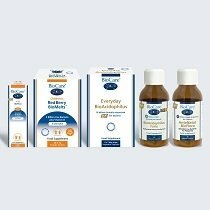 Glucosamine is a popular supplement with the over 50s, and at BioCare we offer two high quality glucosamine products with a different emphasis to meet particular needs. Glucosamine MSM Complex provides 1500mg of both glucosamine and methyl sulphony methane (MSM), plus 300mg of chondroitin sulphate. MSM Plus provides double the amount of MSM with slightly lower levels of glucosamine, plus a generous dose of vitamin B6. 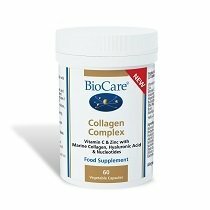 Osteoplex is an effective supplement to support the maintenance of bones and teeth. It provides calcium and magnesium in their most bioavailable citrate form, plus vitamin D, vitamin K and beta-carotene. Osteoplex also includes the trace mineral boron. For supporting cognitive function, Ginkgo plus Blackcurrant is a potent combination of highly concentrated ginkgo biloba with blackcurrant flavonoids. Iron deficiency is more prevalent in the older generation, and our Iron Complex is linked with malic acid to create an organic compound that is easier to absorb. Other products in our Over 50s range include Cholesterase – a powerful blend of vitamins, minerals, enzymes and plant sterols – and Phosphatidyl Serine, a potent phospholipid supplement that delivers 200mg of phospholipids from lecithin.